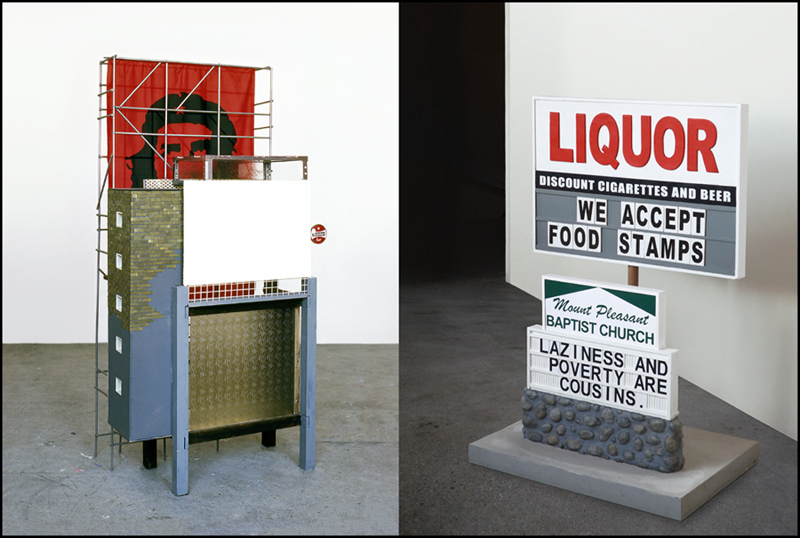 ‘We Accept’ from 2013, a scale model of a Church sign, reminds me of your 1996 sculpture ‘Hasta La Victoria Siempre’ from 1996. Lately it seems that more and more elements from your early work are making something of a come-back. You’re right, it does bring the earlier period to mind. You think you’ve explored a subject to the full, but after a while a different perspective makes you want to pick it up again. Halfway through the nineties, I sort of had it with the human and animal figures and figured I had expressed just about everything there is to express on the subject. I was convinced I had finished the chapter once and for all. I developed a fascination for the urban landscape and the next few years I focussed on creating architectonic installations. Afterwards the human figure returned, placed amidst an environment, or rather: as a reflection of that environment. Before, it was basically about bare existence; birth, life, death. In ‘Hasta La Victoria Siempre’ there’s a portrait of Ché Guevara hanging behind a derelict apartment building as if it were the sun. Is that sun rising or setting? To me, it’s a sunset. But the bar is open! This particular portrait is an interesting case; a photograph spontaneously turned into an iconic image. A very solid logo indeed. The image and what it stands for is recognized all over the world. Big corporations and fashion brands are artificially trying to come up with something similar, but their interest won’t stop at brand awareness, their priority concerns a whole chain of associations deriving from a strong name. Cost nor effort are being spared for the meticulous construction of a brand image and once attained, they use everything in their power to maintain control over it. No one else is allowed to use their logo or anything affiliated with it. Understandable perhaps from their point of view, but this obviously goes too far. People are involuntarily subjected to advertising, it’s like a colonization of the public domain. Nobody asked for instructions on what to think or feel when seeing a certain shape, colour or combination of characters. It’s bad enough to have our perception confiscated for nothing but commercial motives. Wanting to subsequently stop us from thinking our own thoughts and expressing them however, that would be downright totalitarian. No wonder artists and other free-minded creatives are compelled to protest. If we want to take serious the concept of Liberty, we should be teaching our children about propaganda from an early age. Many of your characters wear designer apparel. It’s all around us, isn’t it? You made a portrait of Osama bin Laden. Why him, of all people? Until his death in 2011 Bin Laden was Public Enemy #1, but despite of that – or maybe even because of it – we have very little footage of him. Three or four photographs on the Internet, that’s about it. Seemed like a proper assignment to me. The way you depicted him, it’s as if he is some kind of saint. Exactly. And yet it is a realistic portrait, based on just a handful of pictures. Isn’t that ironic? You play with clichés and your images often seem to convey an archetypical quality. That, in fact, is my fascination. Not that you can change anything about clichés and stereotypes. They’re fixed by definition, that’s what being a cliché or archetype is all about. But they are repeatedly being claimed by all sorts of parties in an attempt to link their ideology or product to them. It is a perpetual sequence of conquering and recapturing familiar images and it causes their significance to keep on evolving. The image of a healthy young blond mother with rosy cheeks and a similarly blushing blond infant on her arm – a harmless picture in its itself – invokes echoes of Hitler and Stalin. And on the other hand you assume that a teenager adorned with skulls and pentagrams has the best intentions and will not hurt a fly. But just when you think you know how things works and that you’re supposed to turn everything you read around, the teen with the occult symbols snaps and starts firing a shotgun at random. In your early work there are a lot of references to Walt Disney who, like The Beatles, represents the magic of childhood to many of our generation. Disney’s influence on my work is undeniable. As soon as I was born, my parents – still in their teens back then – subscribed me to the Donald Duck weekly, really just so they could read it themselves. And in my 60’s childhood, there were these beautifully illustrated hard cover editions of Disney classics; Bambi, Alice in Wonderland, Snow White and Sleeping Beauty, all capturing my imagination. Alice in Wonderland was particularly wonderful, as it was gold-printed like an illustrated medieval manuscript. For a lot of girls in your childhood, Barbie must have been the main role model. You however seem to have identified yourself more with Disney characters. I wouldn’t call it ‘identified’. All I wanted was to be able to draw them. I practiced so hard to master a decent Donald Duck. You can create them with just circles and cylinders. That is still the way I design my sculptures, so although the direct references have come to an end, I’ll probably never get rid of the influence, even if I wanted to. From the Disney artists I copied the basic principles of cuteness. Especially when they provide inanimate objects like teapots and even flying carpets with a believable personality. Later on in life, I learned a different side to the story, one where Walt Disney represents Corporate America and a dominant and petty culture, although I think that this is not as widely perceived in Europe as it is in America. Over here Disney never reached the status of omnipresent figure he has at home, and so there is also less aversion. We have always had lots of alternatives, Europe has quite a strong tradition of comics; in Belgium, in France, Italy… Jacovitti is another influence of mine. I used to own this Pinocchio edition he illustrated, with the graphic detail of an average butcher shop which made it pretty scary. In my early work the use of Disney icons was not primarily intended to criticize a fake interpretation of reality by Disney. When he started out, it wasn’t at all as sugary as it turned out later on. Donald Duck was a very obnoxious character and the animated classics where based on European fairy tales, that can be quite cruel and gruesome. For me, the point was to see if you can still express something personal through a visual vocabulary that has turned into public property. That’s something that still fascinates me. Disney is not ambiguous about evil; it is something to fight off incontrovertibly. Is that how you feel it too? Is your work a spell of defiance? A defiance of evil? I never thought of it that way, but probably… yeah. Yes, you could say that. I wouldn’t be surprised if it is to ward off my own fears as well. When I look at your sculptures, I can see how much Disney’s vitalism appeals to you. Lust for life. Your work is often considered to be disturbing, but aren’t you an incorrigible idealist really? Haha, you reckon? I hope not; optimism is a symptom of despair. 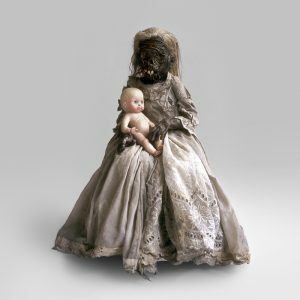 Sure, my protagonists (an adequate label, for most of the time the sculptures show a key moment in a bigger story) seem to possess a strong will to survive, but is that necessarily a good thing? Hollywood has been firing apocalyptical ideas at us for decades and decades. Visions of how the destruction of our planet brings out the best in a small group of survivors. Good fun to watch from your comfortable seat with a bag of crisps in your lap, but a dangerous fantasy nonetheless. That’s what I call disturbing, but apparently different rules apply to different disciplines. As long as it’s clear we’re dealing with a straightforward form of amusement, nobody minds having a few dozen people perishing in a most horrible fashion within the first five minutes of a movie. It’s just a different perspective, a modern day fairy tale to which I am no exception. But in the meantime it goes under your skin. And in most cases, the subtext is rather dubious. The ideal as a modern day fairy tale. Are we idealizing to much nowadays? Ourselves perhaps? Are we losing sight of reality? That’s a tough question. Maybe it’s up to politicians rather than artists to keep an eye on reality. Once politicians get caught up in big stories and big ideals, that’s when you want to run and hide. Are you a cultural pessimist? If you take the message in these survival fantasies and apocalyptic tendencies seriously – destroy everything and start from scratch -, you might come to the conclusion that western civilization has spent its last ideal. I see in your work a conflict between the ethical and the aesthetical. ‘Conflict’ is perhaps a bit overstated. Whatever looks like an incompatible contradiction in writing or speech, doesn’t necessarily have to be so when captured visually. A tragicomedy then? It is not without humour. Translating grave subjects like economical and sexual exploitation into a cartoonesque idiom like I do, is not always appreciated. While in general the aestheticization of brutal violence for the sake of entertainment value, as I mentioned before, is easily accepted. But I’m happy if people can still get upset about it. That’s a good sign, right? Can you tell me something about ‘Mother and Child’ from 2004? I made it shortly after my mother died. It pretty much speaks for itself, I think. All of my art has something of an auto-biographical side to it. I suppose that goes for every artist, but rarely as obvious as with this one. Do you need me to say more? I wasn’t raised religiously at all, you might even call it anti-religiously, but I did visit a Roman Catholic school. Most of the teachers were nuns and friars. Jesuits. I remember visiting the ordination ceremony of one of them. The priests-to-be were lying in line on the floor, wearing a costume that reminds of the Ku Klux Klan. Intriguing rituals, especially to whom they are incomprehensible. And the polychromous, doll-like statues of saints were also very attractive to me. The devil may have all the best tunes, but the Holy Roman church has the most beautiful images. I almost converted. Almost, not quite. Speaking of the best tunes: what about rock n’ roll? What music do you like? Blues punk, grunge, sludge metal, industrial noise, shoegazer, glam rock, some folk, 60’s psychedelia, and anything with the prefix ‘garage-’. I ‘m not bothered by virtuosity. Music is important to me, but I doubt if you can tell from my work. That was different in the nineties, more or less the age of Nirvana. Grunge had its own visual language and connected easily to the work I was making at the time. Everything was one and it felt like being part of a movement, which felt good. Now, that feeling has faded. You say you’re not interested in virtuosity, and in fact there really is quite a number of obscure albums on your shelf of artists hardly qualified to hold an instrument. To me, that comes as a surprise, considering your own work is so very skilful and meticulously finished. You spend months working on one sculpture. That is true. It really is what makes it so hard or – to use the awkward expression – the challenge; to work on one object for such a long period of time and still keep it vibrant. You don’t want people to think on first sight: “O my, what an effort that must have been!” That’s not what it’s about. I really want my sculptures to look like an example of mass-production, so the craftsmanship can’t be on the foreground; in itself it’s just not relevant. Ironically, it can be frustrating when people ignore it altogether. “Look here”, I sometimes hear myself think, “do you have any idea how much work this really is?” Haha. Is there a sculptor you particularly appreciate? A favourite? Not really. I don’t consider myself a sculptor in the strictest sense of the word. I will always value the possibility to express myself trough a different medium. But you can’t deny Hans Bellmer, he’s the patriarch of the genre. And artists like Paul McCarthy and Mike Kelly, obviously. A favourite period in art history then maybe? O yes, definitely the Gothic age. Art from that period often looks very naturalistic but behind it you can sense a greater abstraction. There’s something of an immaterial quality to it. And in spite of the static design it is very alive. Probably because it is static. That’s often the case in sculpture: the more action is suggested, the less alive it looks. So far I mainly heard you talk about popular culture. You don’t like art? I do, but popular culture interests me more, as it reflects the collective subconscious mind. When you explore its subjects and their translation into images you can learn a lot about the sentiments and perceptions of a generation. It’s an organic and coherent whole. Do you consider your own oeuvre as an exponent of pop culture? What’s with the tough questions? Of course, the answer has to be ‘yes’ but at first I was tempted to deny, as if I were taking the risk of disqualifying myself. Actually my work is also a response to pop culture, a comment. But not from the sidelines or – even worse – from above. Like Lennon says, “You can count me in/out”. Is that what you mean? You probably shouldn’t even be differentiating the high-brow from the low-brow. There’s good and bad art, like there is good music and bad music. There are B-films that prove to be classics and examples of art house cinema that where highly acclaimed in their heyday but with little left to offer when you look at them 10 years later. The difference is obsolete and artificial and serves no purpose other than the art trade’s. Value by means of exclusion. Artists ought to be indifferent to it, is what I think. Some are particularly drawn to such mechanisms. I for one am not. You mentioned before, that your work should look like a product. Is that in any way related to the idea that slowly but surely, we are perceiving the human body as a product susceptible to improvement. Is the mouse with the ear a reference to plastic surgery, cloning etc.? To the issue of nothing being sacred for science anymore? The fact that I want my sculptures to look as if mechanically built has more to do with the specific attraction of it. For some reason, when something is successfully created despite a certain degree of unintentiality, its beauty can be unparalleled. 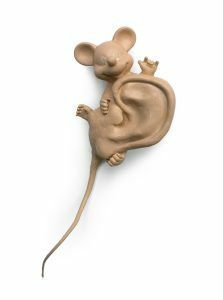 The Mickey Mouse with the ear was made in response to a photograph on the front page of a laboratory mouse with a human ear growing from its back. Shocking to me was not so much the grown ear but rather the part of the mouse, simply to be cut off and discarded in due course, while the ear will live on. The mouse is in far more trouble than the guy receiving a new ear. If there is anything about our body we think we can improve, we won’t hesitate. Beyond the religious domain there are no arguments against it. In that regard we are slaves of technology. If it’s possible, it’ll happen. William Blake says: ‘Art is the Tree of Life, Science is the Tree of Death’. Technology claims to better the world. Does the same go for the arts? We Accept’ uit 2013, een schaalmodel van een Church sign, doet me denken aan ‘Hasta La Victoria Siempre’ uit 1996. De afgelopen tijd zie ik wel meer elementen uit je beginwerk terugkeren. Inderdaad doet het denken aan vroeger werk. Je denkt dat je iets uitputtend hebt behandeld maar later kijk je er op een andere manier tegenaan en dan pak je het weer op. Ik had ik het halverwege de jaren negentig even gehad met de mens- en dierfiguren. Ik had het gevoel dat ik alles erin had uitgedrukt wat erin uitgedrukt kon worden en dacht het hoofdstuk definitief te hebben afgesloten. Ik kreeg belangstelling voor het stedelijke landschap en heb een paar jaar architectonische installaties gemaakt. Daarna kwam de menselijke figuur weer terug, maar nu geplaatst in een omgeving, of eigenlijk; als een afspiegeling daarvan. Daarvoor was het meer de naakte existentie; geboorte, leven, dood. Bij ‘Hasta La Victoria Siempre’ hangt het portret van Ché Guevara als een zon achter vervallen flatgebouw. Gaat de zon op of onder? Voor mijn gevoel gaat de zon onder. Maar de bar is open! Dat portret is een interessant geval. Juist deze ene foto is spontaan uitgegroeid tot een icoon. Ja, precies, een ijzersterk beeldmerk. Iedereen kent het en weet waar het voor staat. Grote bedrijven en modemerken proberen iets dergelijks op een kunstmatige manier te creëren, waarbij het allang niet meer alleen gaat om naamsbekendheid, maar vooral om de hele keten van associaties die aan zo’n naam verbonden zijn. Zo’n imago wordt zorgvuldig geconstrueerd waarbij kosten noch moeite worden gespaard, en vervolgens zetten ze alles in het werk om er controle over te houden. Niemand anders mag iets doen met hun beeldmerk en alles wat daarmee samenhangt. Vanuit hun standpunt gezien misschien begrijpelijk, maar het gaat natuurlijk veel te ver. Mensen worden onvrijwillig onderworpen aan reclame, het is een soort kolonisatie van het publieke domein. Niemand heeft erom gevraagd voorgeschreven te krijgen wat hij moet denken en voelen bij het zien van een bepaalde vorm, kleur of lettercombinatie. Dat er om geen andere dan commerciële redenen beslag wordt gelegd op je de belevingswereld is op zich al kwalijk genoeg. Vervolgens ook nog te willen verhinderen dat je daar het jouwe van denkt en daar uitdrukking aan geeft, zou totalitair zijn. Vanzelfsprekend dat kunstenaars en andere onafhankelijke beeldmakers zich daar tegen verzetten. Als je het begrip vrijheid serieus neemt, zou je kinderen vanaf de kleuterschool les moeten geven in de werking van propaganda. Maar waar hadden we het ook alweer over? Je eigen figuren dragen dikwijls merkkleding. Ja, het is overal in het straatbeeld. 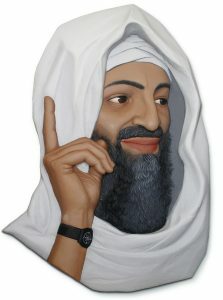 Waarom heb je uitgerekend een portret van Osama Bin Laden gemaakt? Bin Laden was tot aan zijn dood in 2011 staatsvijand #1 maar desondanks, of misschien juist daarom, zijn er weinig afbeeldingen van hem bekend. Drie of vier foto’s op het internet, dat is het wel zo’n beetje. Het leek me dus dat daar een taak voor mij lag. Zoals jij hem hebt uitgebeeld lijkt hij wel een soort heilige. Klopt. Toch is het een realistisch portret, gebaseerd op die paar foto’s. Is dat niet ironisch? Je speelt met clichés, je beelden hebben vaak iets archetypisch..
Daar ligt mijn belangstelling inderdaad. Niet dat je iets aan clichés en archetypen kunt veranderen. Ze liggen vast, daar zijn het clichés en archetypen voor. Maar ze worden wel steeds geclaimd door verschillende partijen, die proberen hun ideologie of hun product eraan te verbinden. Het is een voortdurend veroveren en heroveren van bekende beelden en daarmee is de betekenis ervan altijd in beweging. Een afbeelding van een blozend gezonde jonge blonde moeder met een al even blozende blonde peuter op haar arm, in principe een onschuldig plaatje, roept echo’s op van Hitler en Stalin, en van een met schedels en pentagrammen behangen tiener vermoed je juist dat hij het goed met de wereld voor heeft en geen vlieg kwaad doet. Maar net als je denkt dat je in de gaten hebt hoe het werkt en dat je voor alles het tegendeel moet lezen, begint die met occulte symbolen behangen tiener wild om zich heen te schieten.. In je beginwerk verwijs je vaak naar Walt Disney die, net als de Beatles, voor velen van onze generatie de magie van de kindertijd vertegenwoordigt. Walt Disney heeft onmiskenbaar een invloed op mijn werk gehad. Mijn ouders, die zelf nog tieners waren, hadden me vanaf mijn geboorte direct op de Donald Duck geabonneerd om hem zelf te kunnen lezen. En er waren in mijn jeugd, de jaren zestig, schitterend geïllustreerde hardcover boeken van de Disney klassiekers; Bambi, Alice in Wonderland, Sneeuwwitje en Assepoester, die erg tot mijn verbeelding spraken. Vooral Alice in Wonderland zag er geweldig uit, helemaal met goud bedrukt, net een middeleeuws geïllustreerd manuscript. Barbie vormde in je jeugd een rolmodel voor meisjes, maar jij lijkt je meer te hebben geïdentificeerd met de Disney karakters. Geïdentificeerd weet ik niet, ik wilde ze vooral kunnen tekenen. Met name op Donald Duck heb ik eindeloos geoefend. Alle figuren kon je opbouwen uit cirkels en cilinders. Op die manier maak ik mijn beelden nog steeds, dus hoewel het afgelopen is met de rechtstreekse verwijzingen kom ik waarschijnlijk nooit meer echt van die invloed af, al zou ik willen. Van de Disney tekenaars heb ik de principes van cuteness afgekeken. Vooral van de manier waarop ze levenloze voorwerpen zoals theepotten of zelfs vliegende tapijten van een geloofwaardig karakter voorzien. Later kreeg ik meer oog voor de andere kant van het verhaal waarin Walt Disney gezien wordt als een representant van Corporate America en een dominante burgerlijke cultuur, hoewel dat idee in Europa volgens mij minder leeft dan in de V.S. Disney is hier nooit zo alomtegenwoordig geweest en wekt dus ook minder weerstand op. Er bestond altijd van alles naast, er is een grote Europese stripcultuur. Veel Belgische, Franse en Italiaanse comics. Jacovitti is ook een invloed. Ik had een door hem geïllustreerde Pinocchio die ik behoorlijk eng vond met al die loslopende vleeswaren. In mijn vroege werk gebruikte ik de Disney iconen niet in de eerste plaats om kritiek te leveren op de valse voorstelling van de werkelijkheid die Disney zou geven. Zo mierenzoet als tegenwoordig was die aanvankelijk helemaal niet; Donald Duck was een onaangenaam karakter en de animatie klassiekers waren gebaseerd op Europese sprookjes, en die zijn tamelijk gruwelijk en wreed. Het ging me meer om de vraag of je iets persoonlijks uit kunt drukken in een beeldtaal die publiek bezit is. Die belangstelling heb ik nog steeds. Disney geeft het kwaad duidelijk een plaats. Iets dat onvermijdelijk bestreden dient te worden. Voel jij dat ook zo? Is je werk een bezwering? Een bezwering van het kwaad? Zo heb ik er zelf nooit over gedacht maar, waarschijnlijk wel. Ja, zo zou je het kunnen zien. Het zal ongetwijfeld ook een bezwering van mijn eigen angsten zijn. Als ik naar je werk kijk, zie ik vooral dat het vitalisme in Disney je aanspreekt. Lust for life. Je werk word vaak als verontrustend ervaren, maar ben je eigenlijk niet een onverbeterlijke optimist? Ha ha, zou dat het zijn? Ik hoop het niet; optimisme is een symptoom van wanhoop. Inderdaad lijken mijn hoofdpersonen- zo kun je ze noemen omdat de sculpturen vaak een soort beslissend moment in een groter verhaal laten zien- over een grote overlevingsdrang te beschikken, maar of je daar nou perse vrolijk van wordt? Hollywood bestookt de wereld al decennia lang met apocalyptische ideeën. Visioenen waarin de vernietiging van de planeet het beste naar boven brengt bij een klein groepje overlevenden. Leuk om naar te kijken, vanaf de bank met een zak chips, maar intussen is het een gevaarlijke fantasie. Dat vind ik nou verontrustend, maar blijkbaar gelden voor verschillende uitdrukkingsvormen verschillende regels. Als duidelijk is dat het om puur amusement gaat, neemt niemand er aanstoot aan als er binnen 5 minuten al tientallen mensen op gruwelijk aan hun einde zijn gekomen. Je kijkt er op een andere manier naar, ik net zo goed. Een hedendaags sprookje. Maar intussen gaat het wel onder je huid. En de onderliggende boodschap is vaak nogal dubieus. Het ideaal als hedendaags sprookje. Idealiseren we tegenwoordig teveel? Verliezen we de werkelijkheid uit het oog? Moeilijke vraag. De werkelijkheid in het oog houden is misschien vooral een taak voor de politiek, meer dan voor de kunst. Als de politiek zich verliest in grote verhalen en grote idealen, berg je dan maar. Als je die survival fantasieën en apocalyptische tendensen- alles vernietigen en vanaf nul beginnen – serieus neemt, zou je kunnen concluderen dat de westerse wereld door haar idealen heen is. Ik zie in je werk een conflict tussen het ethische en het esthetische. Nou, conflict…wat in geschreven of gesproken taal een onverenigbare tegenstelling lijkt, hoeft dat in beeld niet te zijn. Een tragikomedie dan? Het is niet van humor gespeend. Dat ik serieuze onderwerpen als economische- en seksuele uitbuiting verbeeld in een cartoonesk idioom valt lang niet altijd in goede aarde. Terwijl, zoals eerder gezegd, esthetisering van grof geweld om amusementsreden doorgaans heel acceptabel wordt gevonden. Maar ik ben blij als mensen er kwaad om worden. Dat is toch een goed teken? Kun je iets zeggen over ‘Moeder en Kind’ uit 2004? Dat heb ik gemaakt vlak nadat mijn eigen moeder overleden was. Het is vrij duidelijk, denk ik. In al mijn werk zit wel een autobiografisch element, dat geldt waarschijnlijk voor elke kunstenaar, maar het ligt er zelden zo dik bovenop als bij dit beeld. Moet ik er nog meer over zeggen? Het ziet er erg katholiek uit. Ja, ik ben helemaal niet religieus opgevoed, eerder anti religieus, maar heb wel op een katholieke school gezeten. De meeste leraren waren nonnen en paters. Jezuïeten. Ik herinner me nog de priesterwijding van één van hen geweest. De aankomende priesters lagen op een rij op de grond in een soort van Ku Klux Klan kostuums. Intrigerende rituelen, vooral als je er niets van begrijpt. En ook de polychrome heiligenbeelden, bijna poppen, spraken me erg aan. De duivel mag dan ‘all the best tunes’ hebben, de katholieke kerk heeft de mooiste plaatjes. Ik had me bijna bekeerd. Maar net niet helemaal. Over all the best tunes gesproken: hoe zit het met de rock & roll, van welke muziek hou je? Bluespunk, grunge, slugde metal, industrial, noise, shoegazer, glamrock, sommige folk, 60s psychedelia..en dan alles met ‘garage’ ervoor. Ik zie niet zoveel in virtuositeit. Muziek is belangrijk voor me, maar of je dat zo direct in m’n werk terug kunt zien weet ik niet. De invloed van film is natuurlijk veel duidelijker aanwijsbaar. In de jaren negentig, het Nirvana tijdperk zeg maar, was dat anders. De grunge bracht een eigen beeldtaal met zich mee, waar het werk dat ik toen maakte bij aansloot. Het was allemaal één ding en ik voelde me onderdeel van een beweging. Dat was prettig. Nu heb ik dat gevoel veel minder. Dat is waar. Dat is ook juist het moeilijke, de uitdaging, om dat vreselijke woord maar eens te gebruiken; zo lang aan één ding werken en het dan toch levendig te houden. Je wilt niet dat het eerste wat mensen denken als ze het zien is: ‘Goh, wat een inspanning moet dat geweest zijn.’ Daar gaat het niet over. Ik wil graag dat het op een massaproduct lijkt dus het ambachtelijk aspect moet niet op de voorgrond staan, het is op zichzelf niet interessant. Ironisch genoeg is het ook weer frustrerend als mensen er helemaal aan voorbij gaan. ‘Ja hoor es,’ denk ik dan ‘weet je wel hoeveel werk dit is?’ Haha. Heb je een favoriete beeldhouwer? Een voorbeeld? Niet echt. Ik zie mezelf ook niet een beeldhouwer pur sang. Ik houd de optie me in een ander medium uit te drukken altijd open. Maar Hans Bellmer kun je niet wegdenken, hij is de oervader van het genre. En mensen als Paul McCarthy en Mike Kelley natuurlijk. Een voorkeur voor een periode in de kunstgeschiedenis dan? Ja, dat wel; de Gotiek. Het werk uit die tijd ziet er vaak heel naturalistisch uit, maar je voelt er een grote abstractie achter. Het heeft een soort immateriële kwaliteit. En hoewel het heel statisch vormgeven is, is het toch heel levendig. Waarschijnlijk juist omdat het statisch is. Bij sculptuur werkt dat vaak zo. Des te meer suggestie van actie, des te levenlozer het eruit ziet. Tot nu toe heb ik je vooral over populaire cultuur gehoord. Hou je niet van kunst? Jawel, maar populaire cultuur interesseert me meer omdat het een soort weerslag is van het collectief onderbewuste. Aan de thema’s die erin tot uitdrukking komen en aan de manier waarop dat gebeurt kun je veel aflezen over de onderstroom aan ideeën die in een bepaalde periode leven. Het is een organisch en samenhangend geheel. Reken je jouw eigen werk ook tot de popcultuur? Moeilijke vraag, alweer. Het antwoord moet natuurlijk ‘Ja’ zijn, maar ik had in de eerste instantie de neiging om ‘nee’ te zeggen, alsof ik mezelf anders zou diskwalificeren. Het is ook een reactie op popcultuur, een commentaar. Maar niet een commentaar vanaf de zijlijn, laat staan van bovenaf. Waarschijnlijk zou je dat onderscheid tussen highbrow en lowbrow helemaal niet moeten maken. Je hebt goede en slechte beeldende kunst, zoals je goede muziek en slechte muziek hebt. Er zijn B films die uitgroeien tot klassiekers, en in eigen tijd hoog aangeslagen arthouse cinema waar weinig van over blijft als je het 10 jaar later terug ziet. Het is een achterhaald en kunstmatig onderscheid dat geen enkel belang dient, behalve dat van de kunstmarkt. Door uitsluiting wordt waarde gecreëerd. Kunstenaars zouden zich daar niets van aan moeten trekken. Vind ik tenminste. Sommigen vinden dat soort mechanismen juist buitengewoon interessant, maar tot die groep behoor ik niet. Je noemde zelf al dat je werk er uit moet zien als een product. Hangt dat samen met het idee dat wij zo langzamerhand naar het lichaam kijken als een product dat voor verbetering vatbaar is, plastische chirurgie bijv.. .. klonen, Is er nog iets heilig voor de wetenschap? Verwijs je daar naar met de muis met het oor? Dat ik graag wil dat mijn werk er fabrieksmatig uitziet, heeft meer te maken met de specifieke aantrekkingskracht daarvan. Als iets gemaakt is met een bepaalde onopzettelijkheid, maar desondanks geslaagd is, kan het om de één of andere reden soms onnavolgbaar mooi zijn. De Mickey Mouse met het oor is gemaakt naar aanleiding van een krantenfoto van een laboratorium muis op wiens rug een menselijk oor is gekweekt. Het schokkende eraan vond ik niet het gekweekte oor, maar de rol van de muis die er gewoon afgeknipt wordt als het moment daar is, terwijl het oor verder leeft. De muis heeft een veel groter probleem dan degene die dat nieuwe oor krijgt. Als er iets is wat we kunnen verbeteren aan ons lichaam, zullen we dat niet nalaten. Buiten het religieuze domein is er geen argument tegen. In die zin worden we geregeerd door de technologie. Wat mogelijk is, gebeurt. William Blake zegt: ‘Art is the Tree of Life, Science is the Tree of Death’. De technologie claimt de wereld te verbeteren, geldt dat ook voor de kunst? Met dat citaat is de vraag eigenlijk al beantwoord.